Yumi Ikoma and Ryou Masaoka are children who have been selected to take part in a top secret mission, to be the pilots of the first Fafner combat units; the last chance of survival for the human race. The enemy is ruthless, remorseless and is able to read the minds of humans. Therefore, the details of this mission are kept a secret even from the personnel involved. The young pilots must use all their courage and faith in order to survive and complete their mission or the fate of mankind would be compromised. This short has a very good story concept, albeit a sad one. However it is not very thought out or explained. I watched this with a feeling that I was missing something through the entire thing. Perhaps there is some sort of prequel that I haven't heard of? Anyhow, onto the review. The last safe island on earth. 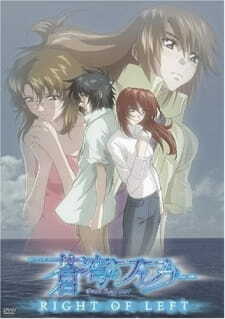 A government which subliminally trains the children of the island to know about the war going on outside, and how to pilot the Fafner mecha which are used in the war. Silicone monsters that attack, and can mostly only be beaten using a Fafner. Fafners can only be piloted by the children, however if they pilot it to much they turn into crystals and shatter. All of this comes together to form a rather good story, however they don't have any back story, the characters aren't explained very much, and all in all it leaves you asking a whole lot of questions. I just didn't like the lines on the cheeks. It makes them all look dirty, or wounded all the time. Really, I never know how to analyze this. I think it's fine. They don't give you much as far as this goes, but it's refreshing the the character with a weak constitution isn't pathetic for once. My overall rating is really just that it felt short and incomplete, but it was a relitively well done show. Not great, but not bad either.